Configuring the external 8MHZ crystal to generate both internal system clock and the SPI Baud rate clock. Using PORTD pin12 (RD12) as the Chip Select Line. Setting up SPI channel 2 ( SCK2, SDO2, & SDI2) to communicate with the EEPROM. The SPI will be configured to work in Interrupt Mode in this example. To implement the read function the main application state machine is designed with 6 separate states. The chart below describes the sequence of the states and the actions taken by the states. Click on the MPLAB® Harmony Clock Configuration tab. 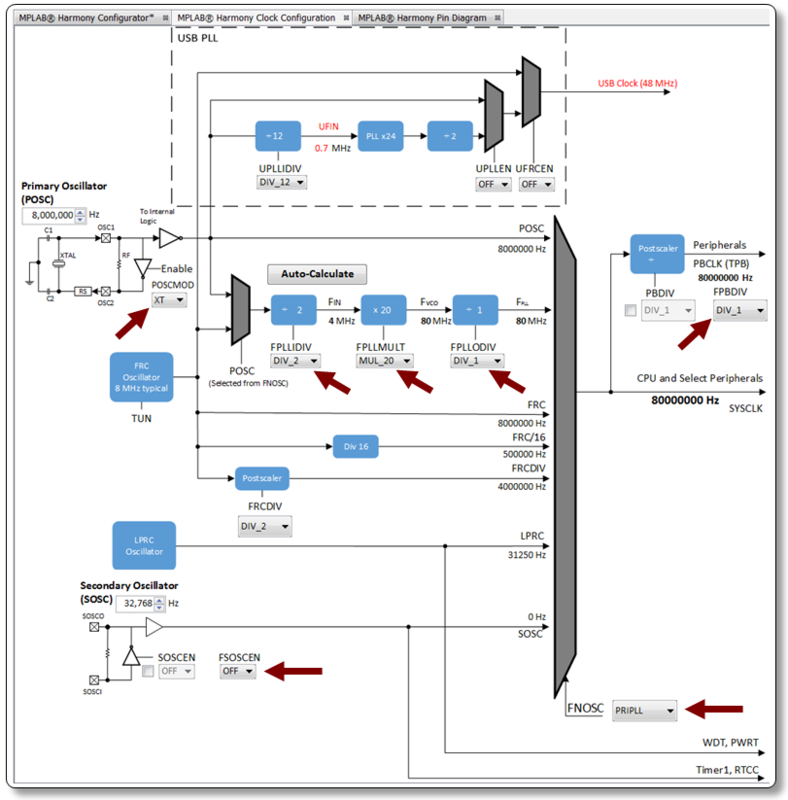 For more detail on the PIC32MX oscillator system click here. 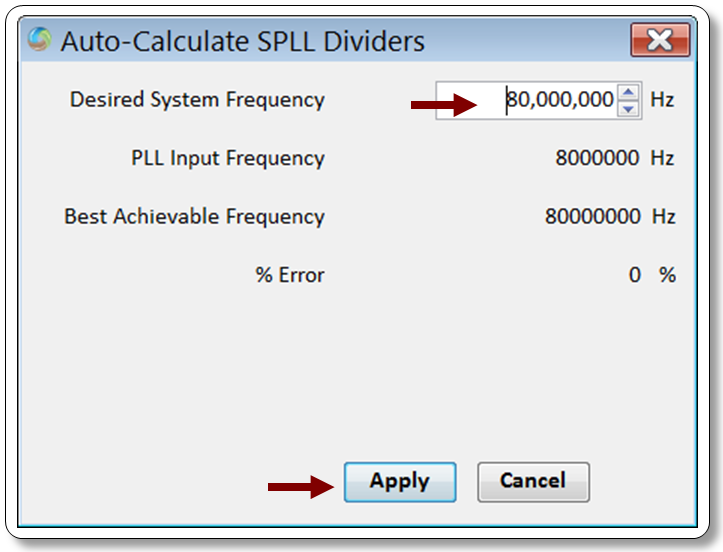 Here's a tip: The System PLL can be automatically configured to generate a specific output frequency. In this example we are using an external 8MHz crystal oscillator to drive the PIC32. 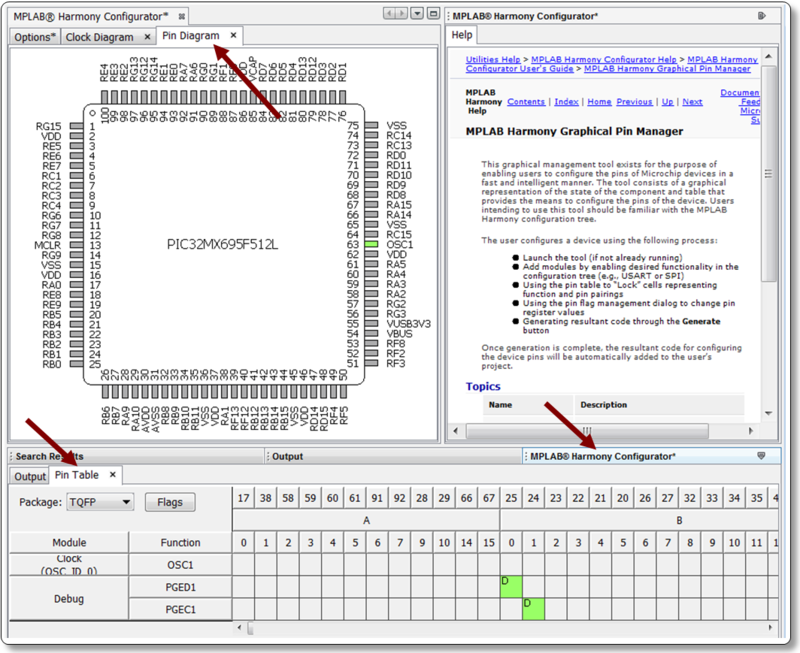 Click on the MPLAB® Harmony Pin Diagram and MPLAB® Harmony Pin Table tabs. Click on the "Flags" button to open the "Pin Flags" window. 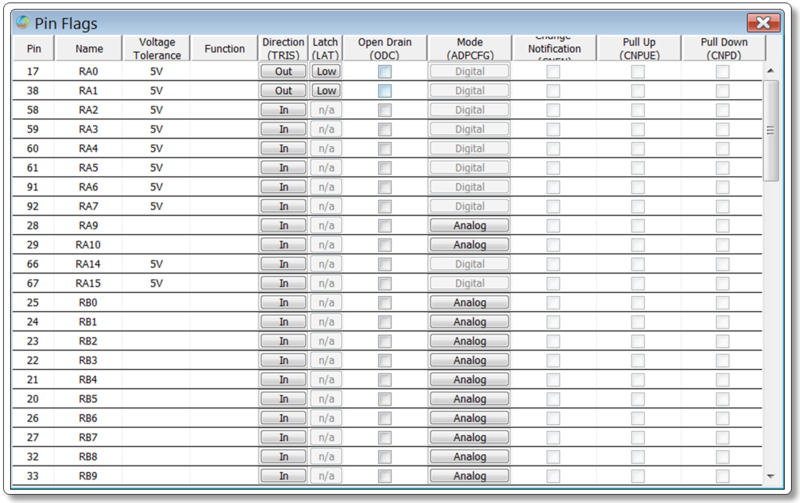 Click on the buttons in this window to configure the PIC32 I/O Port pins per the table below. 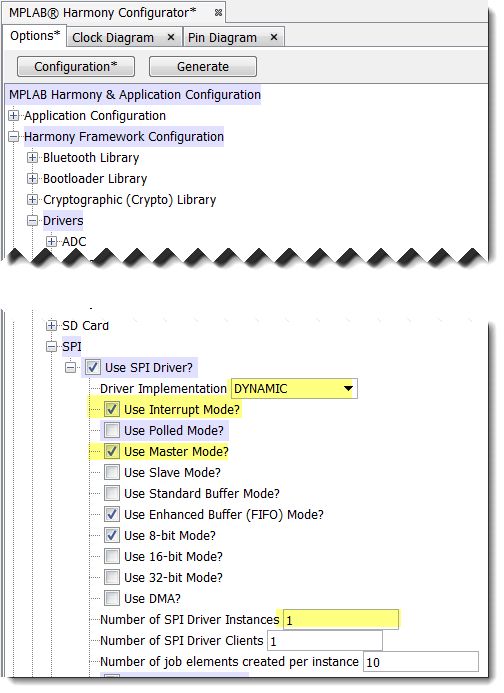 Ensure at least one SPI Driver instance is chosen. "Master" is checked under Master/Slave Mode. When the project is generated MHC will configure the project files. The application developer will have to create the application's data structures and functions. The developer is also responsible for generating the code for the application state machine. 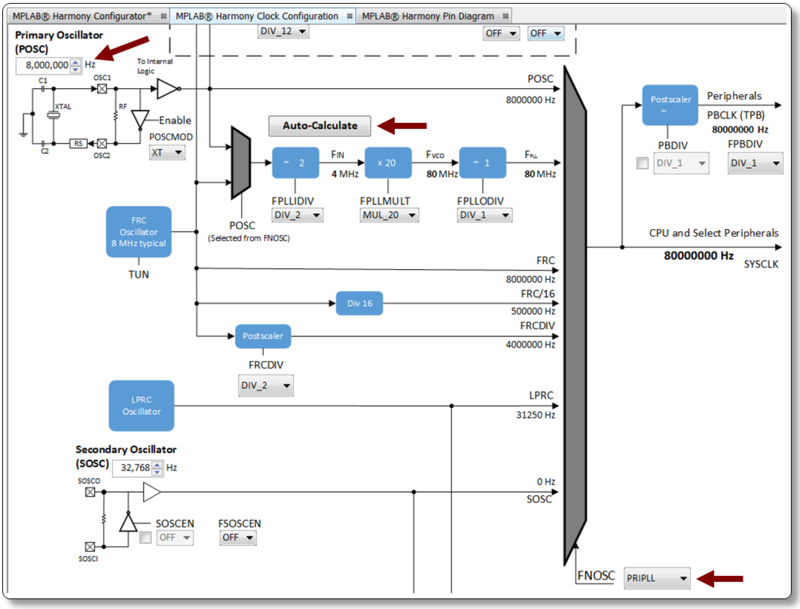 Inside the file system-init.c MHC places the call to the SPI initialization routine. The system initialization function also set the interrupt priorities for SPI. drvSpi0InitData is the data structure containing the values to be loaded into the SPI special function regiisters. drvSpi0InitData is defined in system-init.c. The data elements used to contain the values for drvSpi0InitData are loaded into system-config.h by MHC. When the interrupt mode is selected MHC will cause the interrupt vector to be placed in interrupt.c. 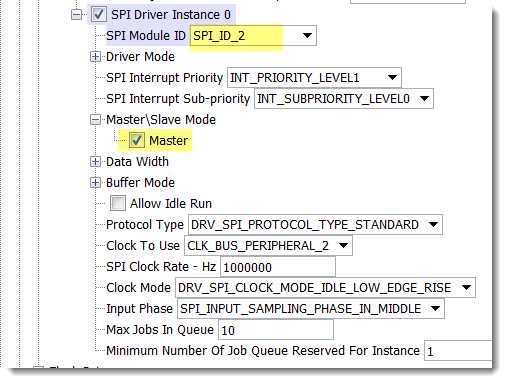 The ISR will call the Harmony Generated function DRV_SPI_Tasks with a pointer to the object for the SPI instance being accessed. sysObj.spiObjectIdx0 is the data object for SPI instance 0. DRV_SPI_Tasks invokes a callback function. MHC determines which callback to use depending on if an enhanced SPI buffer is being used. The selection of the callback routine presents no considerations for the developer, the APIs and program flow are identical. The main system while() loop does not call DRV_SPI_Tasks. The application needs several variables to be defined. The code below shows the initialization of the application and the progression of the Application State Machine. The protocol, describe at the top of this page, reads 2 bytes from the EEPROM beginning at address 00.
case APP_STATE_INIT: /* opens the SPI channel. and one byte of don't cares. ( 0x00). receive the contents of the address 0x00, and 0x01 from the EEPROM. case APP_WAIT_FOR_DATA: /* Checks to see if the SPI peripheral has finished receiving the data.